Like other legumes, green lentils or moong are low in fat and high in protein and fiber, and have the added advantage of cooking quickly. Moong have a mild, often earthy flavor, and they’re best if cooked with assertive flavorings. Lentils cook more slowly if they’re combined with salt or acidic ingredients, so add these last. Moong can be cooked in many ways, with the traditional onion tomato gravy, on its own as a dry dish, if sprouted can be cooked as a dish to accompany kadhi or in salads. Most Indian families cook moong at least once a week if not more. 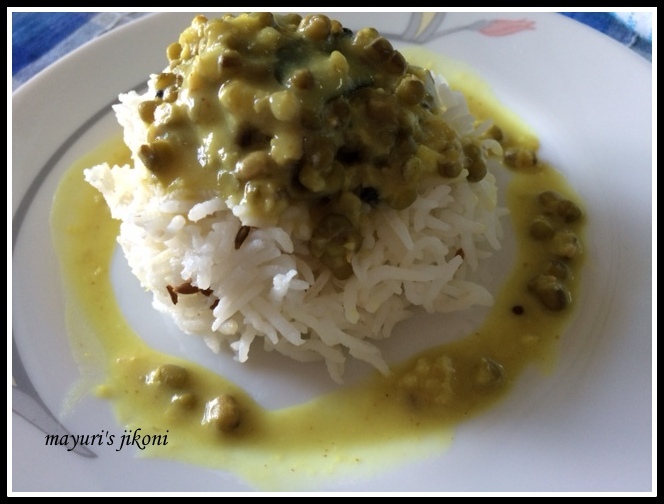 Moong curry with a spoonful of ghee tastes very delicious. My recipe is khatta (sour) moong. I prefer to make this type of moong to give that slight different taste as I tend to make lentils practically everyday. The usual tomato onion gravy makes all the lentils taste the same. The first time I had khatta moong was when my kaki made them with just a lot of garlic. My version is slightly different. Khatta moong is a common Gujarati curry. Serve them with hot, hot chapati or rice. Soak the green lentils in warm water for about 2 hours. Discard the soaking water and rinse the lentils under running water. This removes the phytic acid. Boil the moong in 3 cups of water over medium heat till done. I prefer to use the pressure cooker. I put the moong in the cooker, cover it with just enough water and cook it for 3 whistles. Whip chickpea flour and yogurt together. In a pan, heat the ghee or oil. Add cinnamon, pepper and cloves. Add mustard and cumin seeds. Add the curry leaves and asafoetida. Add the chopped garlic, ginger and chilli paste. Saute for a minute or so. Add the yogurt chickpea flour mixture. Add salt and turmeric powder. Stir till the mixture becomes thick.Stir constantly so that the yogurt does not curdle. Add the cooked moong and remaining water. Let the lentils cook over medium heat for a further 5 -10 minutes. Garnish with coriander or spring onion and serve hot with an additional spoonful of ghee or a dollop of butter. Adding soda bicarbonate while cooking the beans destroys the nutrients. If the beans do not cook in the required time, it means they are old. I generally do not use too much of chilli as it tends to mask the flavours of the other ingredients. But you can add more if you like. Thickness of the curry can be adjusted to your liking. I prefer thick, wholesome curries as opposed to the watery variety. Phytic acid is said to cause flatulence. Soaking the beans in water for a while removes it. We make this curry too but without besan… looks yummy. Sounds delish! I love curry and I'm sure this sour curry would be perfect for dinner! Shobha I use to make it without the besan too but found that it was becoming to watery. The chickpea flour helps to thicken the curry and the yogurt doesn't curdle up. Thanks Jessica, it is a healthy curry, perfect with rice or naan or rotis. As I mentioned before, Linsy, chickpea flour just helps to thicken the curry.